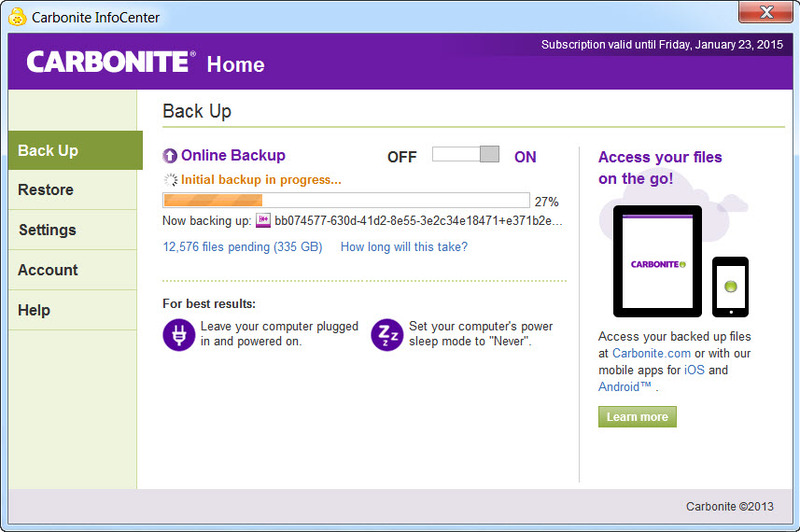 As I explained in a previous post, I am initiating the Carbonite service to augment my current process of backing up my computer files. I started my initial backup about two weeks ago. Since then the progress has been quite slow, but steady and without incident. The figure below is a snapshot of where it stands as of a few minutes ago. I am about one quarter of the way through the process. At this rate, it will take about two months to complete. This is longer than I initially expected. I can live with this, however, because I am continuing to use my primary back up process during this period. Also, as near as I can determine, Carbonite is not impacting the performance of my PC as I go about using it in my normal way. If you have not seen it yet, there is a page on my website that describes my recently completed eBook, Photoshop Elements 11: The Organizer Revisited.